In this article, first, I want to talk to you about the M4A1 and what makes it our bread and butter choice across special operations teams. I will discuss the good and the bad, and why I think it’s here to stay. Without a doubt, the M4 platform has been a success with a proven record but there are some lingering deficiencies to address as with any system. The Close Quarters Battle Rifle (CQBR)/Mk18 is slightly newer on the scene but is also making headway to securing its success being adopted by more teams. The M4A1 carbine entered service in 1994, taking feedback from lessons-learned in the Gulf War where the M16 series was dominant. A lot of troops were asking for a shorter weapon for a variety of reasons such as urban operations, vehicle crews, and special operators to name a few. 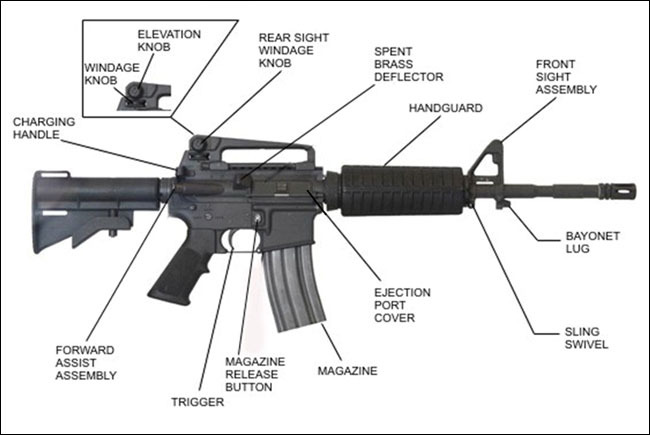 With advancing technologies in optics and laser systems, there was a desire to produce a more effective and modular weapon, and that’s where the M4 platform excelled with the introduction of the Special Operations Peculiar Modification (SOPMOD) Program which had been growing since the late 80’s and began production in 1992. 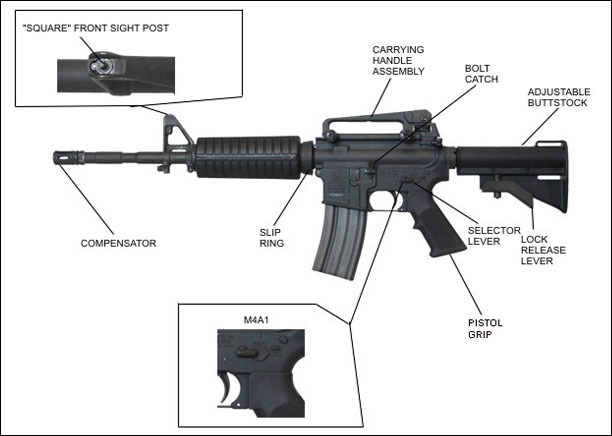 The CQBR Upper Receiver is a drop in replacement for the M4A1 standard upper receiver and when installed is known as the Mk18 by type-designation. It was originally intended to replace the 9mm MP5 series of sub-machine guns with a weapon firing the common 5.56mm round capable of penetrating body armor, while still making use of SOPMOD accessories. As such, it is very effective in Close Quarters Battle (CQB) environments. Being designed by the Navy (NSWC Crane), SEAL Teams were the first to adopt it in 2001. It has some slight differences over the 14.5” upper due to having a shorter 10.3” barrel. The shorter barrel requires an enlarged gas port to cycle properly so it was enlarged to .070 from .062, and the bolt is upgraded using a one-piece gas ring and enhanced extractor spring. The flash hider is also purpose made for attaching the M4 Quick-Detach Sound Suppressor. One downside to the CQBR is that it can become extremely hot in full-auto, measuring up to 713°F after prolonged firing. I’ve personally seen the heat when we ran a suppressed CQBR with 2 100-round Beta Magazines in full-auto back-to-back which left the gas tube glowing white and the barrel red hot. It wouldn’t have been possible to handle the weapon without the vertical grip and gloves. 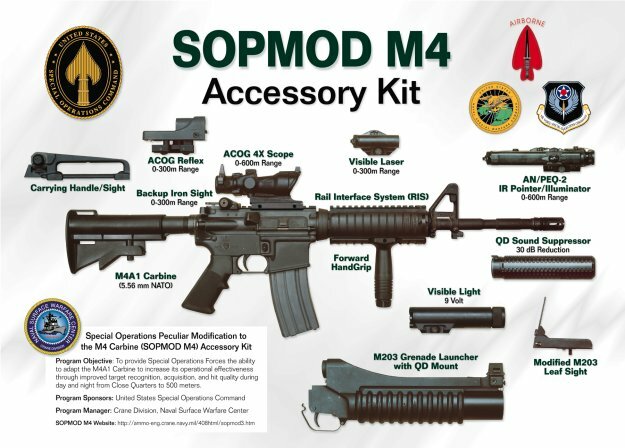 What really adds teeth to the M4A1/CQBR is the aforementioned SOPMOD program which provides outstanding modularity and sets it apart from any other weapon system in the world. Some of the best available technology is being fielded to our guys downrange, enabling them to get the job done anywhere, anytime. The program keeps current with emerging technologies and it shows when comparing the current kit to the former. My units weapons were typically set up with an EOTech Holographic Weapon Sight, an Advanced Target Pointer/ Illuminator/ Aiming Light (ATPIAL), and an M3X Weapon Light. 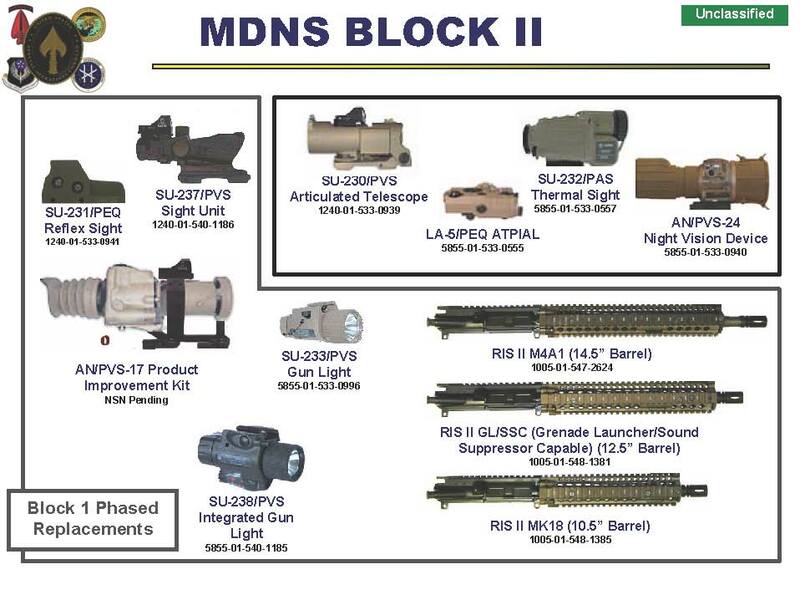 The actual names for all of the gear gets confusing as you can see from the Block II image. The systems I just named in tech-speak would be the SU-231/PEQ, LA-5/PEQ ATPIAL, and the SU-233/PVS. A mouthful and far more confusing than just using the commercial names for the equipment which is what most do in practice. Ammunition in 5.56x45mm has been a source of controversy for many citing a lack of stopping power. I want to go into detail here since this is a very misunderstood topic. A lot of guys don’t understand that when shortening the barrel, the effectiveness of your round decreases since it was designed for a 20” barrel. The desired effect is that on impact the bullet yaws (tumbles) and fragments, causing severe trauma. The early M193 round fired from an M16A1 was exceptionally effective at tumbling and fragmenting, and caused a stir as being an ‘inhumane’ round due to the severity of wounds it produced. The sooner the bullet does this inside our target the better. On a shorter barrel, the potential for that decreases and so does our lethality, causing so called ‘through-and-through’ hits caused by the reduced velocity of impact. Operators in Somalia, Iraq, and Afghanistan reported having to shoot guys close-in multiple times to stop hostiles. What was likely happening was the bullet was not performing, and then shot placement can be argued. I bring up shot placement to point out that a regular bad-guy pumped full of adrenaline might take what seems like eternity to go down, even if hit in the lungs, heart, or liver/spleen. Only a brain or spinal (central nervous system) hit will cause an instant drop, even when placing good hits in the chest. Currently, we are using the 62-grain M855 ‘green-tip’ with a steel penetrator. It has been established in several studies that for reliable yaw and fragmentation of the M855 round, the optimal engagement would be inside of 50 meters for the M4 and 30 meters for the CQBR. Many units have taken the heavier 77-grain open-tip boat tailed Mk262 long-range match round meant for sniper application and begun using it for combat loads in the CQBR because against an unarmored opponent the round tumbles and fragments immediately inside the target even at extended ranges. 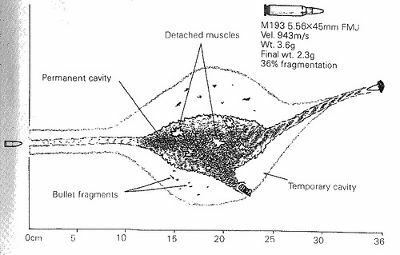 Alternatively, the Reduced-Ricochet Low-Penetration (RRLP) Frangible round has also been shown to be effective at close ranges. In 2010, the Army began producing an improved M855A1 Enhanced Performance Round (EPR) which is tailor-made for the shorter M4 platform. It uses a larger penetrator backed by a copper slug and according to the Army was superior to 7.62mm in some tests. The new round produces a higher muzzle velocity, improved accuracy, a lower flash signature, and vastly improved lethality. The round is also unique in being completely lead-free which is a first for military 5.56mm ammunition in common use. The new round can penetrate 3/8” mild steel unlike the standard M80 7.62mm and was tested out to 1000 meters against 24-layer kevlar, still achieving complete penetration. Time will tell with the new ammunition, but I’m hopeful it will prove to be a much better round for our warfighters, especially in lethality. I think the system as a whole is still very effective, and there has been a consistent drive to improve the deficiencies that are coming up. There are some problems I haven’t mentioned yet that have been publicized in the media. The weapon is said to foul easily when dirty for instance. In my experience in Iraq, this wasn’t a problem unless the user neglected to clean and lube the weapon at all. I’ve seen weapons caked in carbon and still run fine, as long as the system was ‘wet’ with a slight coat of lubricant. The dust issue could be remedied in all of 5 minutes with a simple nylon brush and a few drops of lubrication. Some users were under the false belief that keeping the weapons dry of lubricant was beneficial to keeping sand out, but I can say from experience that this will cause more malfunctions than nearly anything else will. 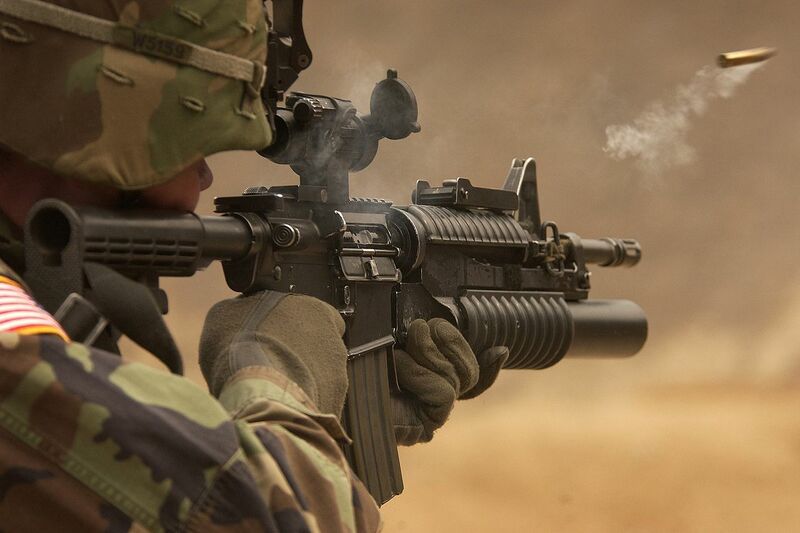 I believe that with the Army investing in purchasing more and more systems, that the M4A1 will be around for a long time coming. There are competitors just chomping at the bit to take the reigns, such as Heckler & Koch with their HK416 piston system, the FN Herstal Mk16 SCAR (SOCOM is abandoning these already), and other commercial systems. Many want a new caliber such as 6.8mm but I don’t see it happening unless NATO as a whole adopts it first. I think it’s safe to say the M4A1 will still be king of the block in 10 years time. The commercial market has seen an explosion in growth of AR-15 designs and accessories showing it is just as popular with civilians as it is with operators, and rightfully so. For further reading, please follow the article links.